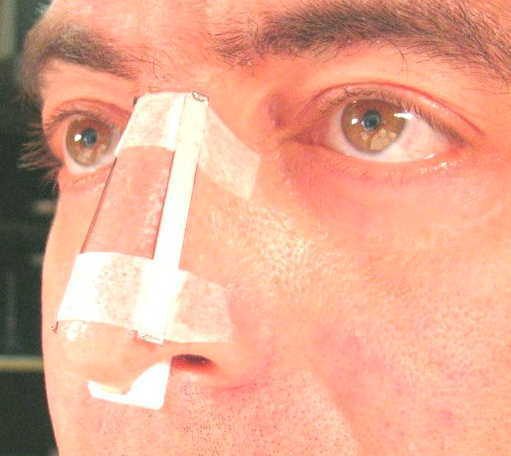 For 23 1/2 hours a day I wear this home-made prothesis to support my nose. I remove it for shower, and by the end of that time my nose begins to ache in the same way it did for 3 months after surgery. The tape and splint stretch and hold the tip out. The white 'U' pinches the gap and keeps the center from collapsing up inside. In addition to the splits, this Teflon part gently pinches the inside middle of my nose at the gap of the missing cartilage. This helps to prevent the middle of my nose from shrinking up inside. If it does that, it aches.